I love putting a Southwest spin on the traditional Midwest picnic food from my childhood. It is my past and present merging into a simple, delectable side dish. We recently attended a potluck pool party at friend’s place; the quirky, rockin’ gal who runs CountryinAZ.com. We both grew up in Illinois and share a love of country music; we even attended the same college, although I beat her there by about a decade. Fate brought us together through mutual folks here in Arizona and now we are blogger buddies. 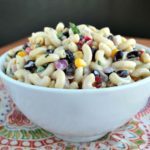 [bctt tweet=”Fiesta Macaroni Salad http://wp.me/p5wK91-vJ #summer #picnic #potluck #bbq #grilling”] When a blogger buddy invites you to a potluck you have to bring your A-game. Especially when the hostess declares you have to bring a ‘blog-worthy’ side dish. Well, let me tell you, this Fiesta Macaroni Salad fits the bill perfectly. It is delicious and ready in the time it takes to make the pasta. 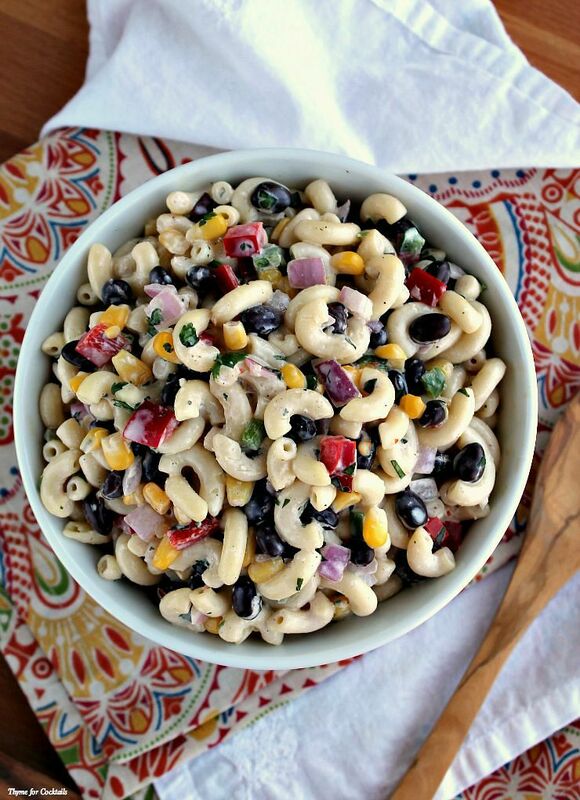 Fiesta Macaroni Salad has al dente elbow macaroni, black beans, and local veggies in a creamy sour cream cilantro dressing. It is the perfect make-ahead potluck/picnic/church social dish. The longer it sits in the fridge, the better it gets. Use a little sour cream or whole milk to loosen it up after chilling. 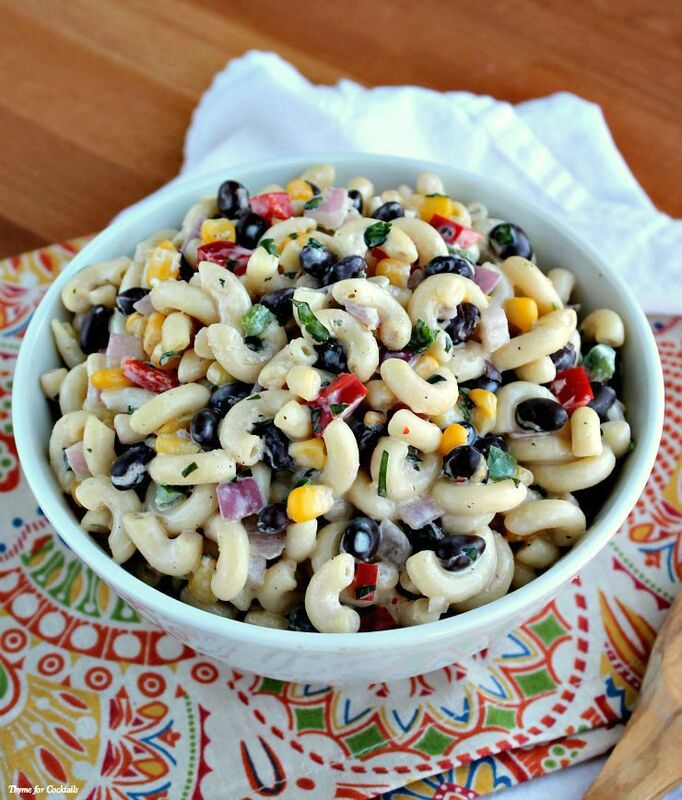 Fiesta Macaroni Salad has al dente elbow macaroni, black beans, and local veggies in a creamy sour cream cilantro dressing. Prepare pasta al dente according to package directions, generously salt water. Place frozen corn and beans in colander; drain pasta over veggies. In a large bowl whisk together sour cream, cilantro, agave nectar and seasonings. Add remaining ingredients; stir to combine thoroughly. Chill before serving. Add a small amount of sour cream or whole milk to restore creaminess after chilling. Oh I will have to show this to my Mother! She loves Macaroni Salad! Thanks Meagan! I hope she tries it! 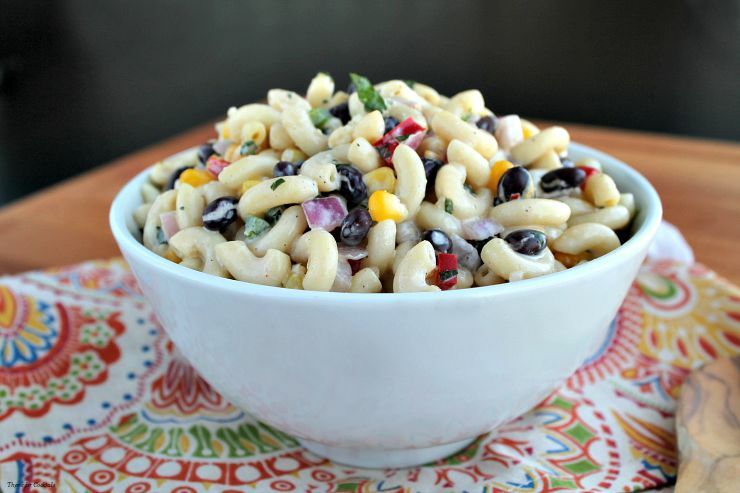 I eat macaroni salad for lunch quite often and will be trying this one out! Thanks! It’s so easy to make Cynthia!